1. After feeding the post yell “double”. 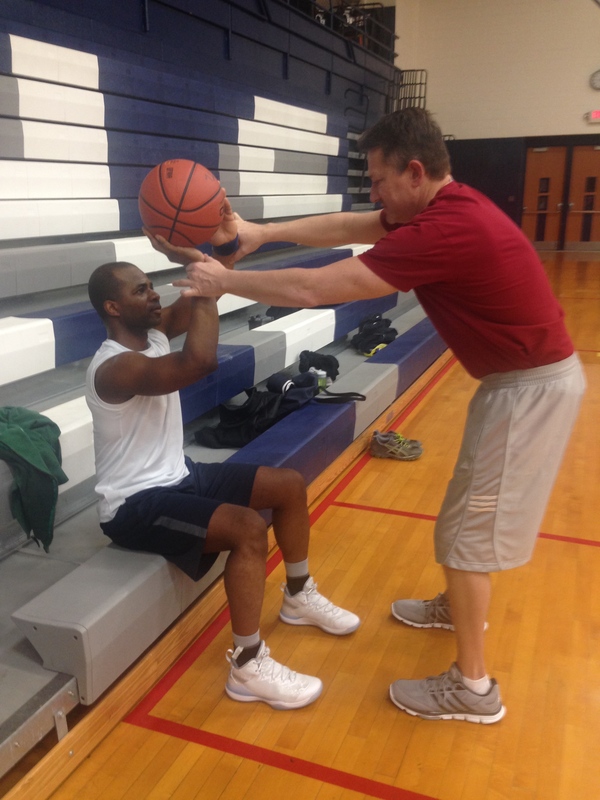 This is fundamental, as fundamental as the “Mikan Drill”. Why yell double? The player guarding you invariably goes to bother the receiving post player. One of the first (fundamental) things the post player does is turn and look middle. The post player cannot look middle AND see your player who has vacated you to double down. Help out your teammate in the post by yelling “double”! 2. Let the post player get position before you feed the post. Not doing so more often than not results in a deflection (almost as bad as a steal). Posting up means, posting up by definition is, getting the defense on your back so you can manipulate and hold off defense so that the post player can receive the ball cleanly. It’s offense: be patient! 4. Shoot for swishes (“Swish Game”). Fred Hodson of Jonesboro, IN, NTL’s famed Shot Surgeon at our Weekend Camps (he slices open, takes apart and slowly stitches back together your shot – no pain killers) says “shrink your target”. In other words, don’t just shoot to get the ball in the hoop; shoot it to get it in a particular part of the hoop. There’s a game, comes by many names that is helpful. The “Swish Game” goes like this (it can be done from anywhere): you take two from the FT line. If you miss, it’s minus one; if you make a perfect swish (no rim at all), you get plus one; if you make but hit the rim, you get zero for that shot. Then your partner (opponent) does the same, takes two. Play to plus six or to any number you want. Making shots will all of a sudden become a by-product of shooting. 5. Aim for the bottom corner of the backboard when feeding a post player who is being fronted. I got this from Tom Thibodeau when we were coaching together at Harvard and we’d play pick up or summer league games. I’d have it on the wing; he’d be posting up. I would situate myself so that Thibs would be between me and the hoop. If he was fronted, he’d keep the defender there and tell me to throw the ball up to the corner of the backboard. This would keep the ball out of the middle of the lane where hep might be coming but also allow him (the post player) to pull it in, get footwork down and score in the lane. When needing to cover a long distance, maybe after a steal or long rebound, and you have no one ahead of you and you want to finish the trip and the play as fast as possible, use the alternating hands dribble technique. Don’t cross the ball over, extend your arm and put the ball down in front of the other hand. 3-4 dribbles and you should be able to cover a full high school (84′) or NBA/NCAA (94′) court. Named after NBA legend, Jack Sikma. Also known as “inside pivot”. Especially important when defending a 2-on-1 or 3-on-1 fast break or when helping against penetration on defense and you want to make the dribbler pick up his/her dribble without fully committing to the dribbler. Many defensive players, especially in pick-up games or recreational league games react to a ball screen by trying to go under the screen. If so, screen on the low side of that defender so it is even harder for that defender to get under the screen. This will drop the defender so far under that the ball handler who you are screening for will be free for a wide open, undefended shot. In our Boston NTL Weekly Practice Programs, we are running a clinic during the winter term called “50 Little (Big) Tips & Scrimmage”. The idea is to present 5 “tips’ each week for the ten week duration that don’t usually get talked about, tips that heeded and added up can make you a much better basketball player. We introduce and demonstrate and practice them and look long and hard for players to implement them during the practice-ending scrimmage. Missed shots taken from the corner go long 2/3rds of the time. Since defense positions themselves between the ball and you, pin them underneath the basket and take those 2/3rds of the time misses as they go long. 2. Whenever you have the ball and you see the back of a defender’s head, pass to the person that is being face guarded. It’s 2 points and an assist for you. 3. “Fake a pass to make a pass.” Can’t get the ball to where you want to pass it? Fake a pass to get the defense to step off and then make the pass where you originally intended. 5. Attack the defender’s top foot. Defender’s right foot is up? Attack it by going to your left. Defender’s left foot up? Attack it by going to your right. Having that foot up makes the defender crossover step, a slower move, and a move that puts them a step behind you. A hero’s what I’m not. While triangles were shifting on the floor. The quiet now they only want two more. And you step to the line. Every shot I’ve taken, has led me to this moment since I was four feet high. You try to see your future from the line. You’re clinging to the notion you’ll be fine. But the circle’s getting smaller all the time. The simpler the better. The more complicated your shot is, the more movement there is, the harder it is to duplicate over and over, especially in pressure situations. Develop a short stroke. Once you’ve proven it, you no longer have to worry about missing. All you have to do is apply the technique. 2) Set your shot. Ball set. Forearm straight up and down if possible. My mantra: “Start straight, finish straight.” (Elbow in at finish.) Start straight means shooting forearm as straight as the walls around you. Imagine the shot. Imagine what it takes from legs and extension to not be short. Never be short. Take a good look at the rim. (As Al McGuire used to say: “the answer is in the eyes”.) This helps you figure out range. Don’t get mesmerized and woozy looking at it; just figure the distance and say hello to the rim. Follow through at the rim, directly straight at the rim. Good follow-through will give you good rotation. You always want to be relaxed and apply your technique. You go to the line in the middle of a game and you should think of nothing but applying your technique, the technique you trust. You apply the technique, you make the shot. In game deciding situations, you never want to think about missing. If you think about missing, you miss. Instead, think about applying the technique you trust. Don’t say to yourself, “can I make this?” Instead say, “can I apply the technique I trust?” The answer, of course, is “yes!” You’ve done it hundreds and thousands of times. And that is why you need to develop a technique, a method that is simple and easy to duplicate. Start straight. Short stroke. Finish straight over the rim. Practice under pressure, even if it’s make-believe pressure.